A black and white photograph of the front of All Saints' Anglican Church, looking north from Dundas Street at Centre Street. All Saints' Anglican Church was built in 1865-66 at the north-west corner of Dundas and Centre Streets. Click the link on the right side of the page to see the same view on September 10, 2013. 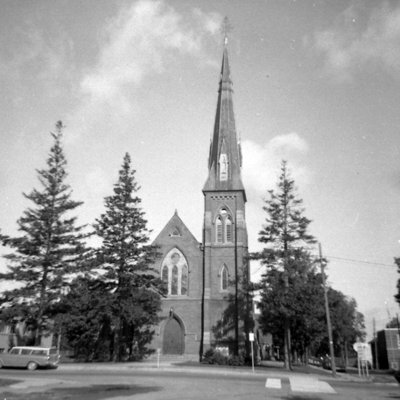 All Saints' Anglican Church, May 1964, Brian Winter. Whitby Archives A2013_004_147.